A Powerful Text Editor for your Website! 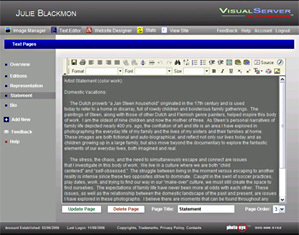 · Create your own custom text pages such as bio and exhibitions. 1. What's the quickest way to build my website? Click the Image Manager, Add a portfolio, Highlight the portfolio, Upload some images. Publish those images. Boom! You have a website in a matter of minutes! View it by clicking the View Website link in the top menu system. 2. I've uploaded images but I don't see them on my website. The images have not been published (made visible). Images are not immediately viewable on your website for several reasons. First, you may want to re-sequence the images before showing them by using VisualServer's drag-and-drop. Second, you may want to add a title, price or other information to your images before making them live. Double click each image, and check the publish checkbox when you are ready for the world to see them. 3. I have already registered my domain. How do I use it for my VisualServer website? When you're ready to go, we'll help you transfer your registered domain (eg. yourname.com) to your VisualServer website. Just email help@visualserver.com. 4. What exactly is a Category and how can I effectively use it? Categories are a way to group your portfolios. Say you have Fine-Art and Commercial work. Create separate categories for both, off the root level (shown as the globe) of your website tree. Then create portfolios under each of those Categories. You may also include any number of subcategories (eg. under Fine-Art you could have separate subcategories: Spain, Europe, and any others). However usability studies have shown that you don't want the viewer to have to drill down too many times to get to your image portfolios. 5. How do you change the order of images in the gallery and select a different Home Page image? VisualServer randomly pulls the Home Page image from the first image of each of your portfolios. Refresh your Home Page to see this in action. Our powerful drag-and-drop system lets you easily resequence your images within each portfolio. You may also drag-and-drop images from portfolio to portfolio or even change the sequence of the portfolios within the tree using the same method. 6. I don't see my format or process in the image attributes popup windows. What should I do? Currently we have the most common photographic formats and processes in their respective drop-down boxes. However, your process may be unusual. Simply choose "Other Format" or "Other Process" from the drop down list and enter your process as a "Portfolio Default" or as "Unique to this Image." If there are a number of requests for the same format or process, we'll add it to the drop-down box list on a future release. Keep in mind that all of these attributes are optional. 7. What are the image text attributes used for? Think of image text attributes as the information used for a image wall label, such as title, process, size, and price. You may show some or all of this information next to your images on your website. See the Label Maker in the Website Designer for the current list of attributes. Other attributes such as Format, Location, and Keywords are for future use. w x h. However my images are a mix of verticals and horizontals. Can I change this to show the largest size first? Think of this as a wall label. The convention is to always have the width and height be written in the same order. The defaults are set for each portfolio and are there to help you save time. Choose the default that makes sense for the majority of your work. Override any defaults for pieces that are different. 9. Will there be additional charges for new upgrades to VisualServer? We are constantly working to improve VisualServer. All updates to the basic VisualServer engine are free and many new features are being planned. Other features may be added as pay options. Send us your requests for any new features.